Clover Hill Farm’s world-class boarding facility is located in Paris, KY. It is centrally located within a close drive from Lexington, Georgetown, Winchester, Mt. Sterling and more. It is a sanctuary just outside of town for your horse to live and for you to ride, learn and make new friends. Ours is a private, friendly community of horses and horse owners and we invite you to make an appointment to come and visit us and see first-hand what we have to offer you and your horse. Call us at 859-444-5737. We’re here to answer all your questions! At Clover Hill Farm, We Provide Exceptional, Full-Service Care For Your Horse. Full Care Stall Board $550/month. Each horse has its own 13×13 stall. The desired turn out regime is implemented. Each stall is cleaned, watered and hayed daily. Horses are fed twice a day. We’ll ensure your horse’s dietary needs are met according to his/her needs. Needed supplements or medications are administered. Hay is supplemented in the paddocks in the Winter. Staff interacts with every horse on a daily basis, to make sure his/her well being. Full Care Pasture Board $295/month. Your horse is placed in the most suitable pasture. Hay is provided in Winter months. Special dietary needs are accommodated. Grass or grain regime can be implemented. Supplementation or medications are given as needed. Grain is fed twice daily. Staff interact with every horse on a daily basis, to make sure his/her well being. You can enjoy access to the barn for tacking up, storage, bathroom, showering your horse and guest room. Our entire facility is maintained to the highest standards. Our Boarding Facilities Have Everything You Need To Enjoy Your Time With Your Horse! Call Us At 859-444-5737. We're Here To Answer All Your Questions! 120 acres of trail riding on beautiful bluegrass rolling hills. Clover Hill Farm is proud to provide a lovely place for your horse to spend its golden years. We’ll care for your horse like it was our own. Click Here to learn more about our horse retirement program. Please inquire with us if you will be needing training. 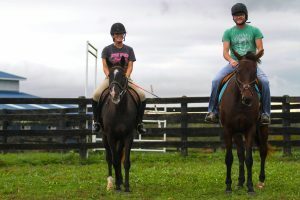 If you are interested in riding instruction please visit our lessons page. Join us and become a part of a growing facility with a positive, friendly and caring culture!